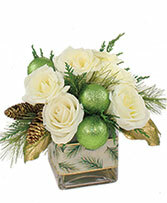 Cube Vase, Foliage: Seasonal Evergreens (Cedar, Pine), Salal Leaves (Accented W Gold Paint), White Roses, Gold Pine Cones, Glitter Green Mm Balls, Seasonal Winter Ribbon (Around The Outside Of Vase). 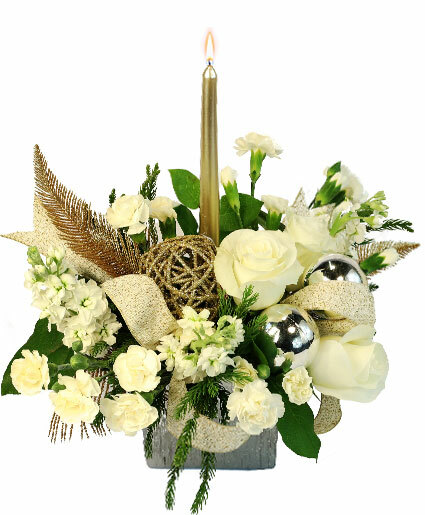 White roses, evergreens, gold pine cones and glittery green balls form a wintry wonderland that is just the thing to lift holiday spirits. 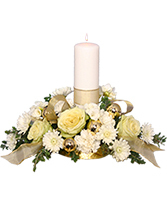 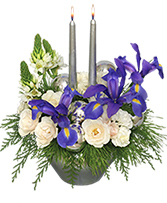 Order this elegant bouquet of festive flowers today!